Behrouz Boochani, a Kurdish-Iranian journalist detained for more than five years in Papua New Guinea after seeking asylum in Australia, has won two Victorian Premier’s Literary Awards for his debut book, No Friend But the Mountains: Writing from Manus Prison, even though he’s still not allowed into the country. Boochani fled from Iran to Indonesia “after his pro-Kurdish publication attracted the scrutiny of Iranian security forces,” according to NPR. In 2013, he was hoping to seek refuge in Australia when his boat was intercepted, and he was detained at Manus Island, Papua New Guinea. Australian officials call Manus Island, which is officially closed but has yet to release hundreds of inmates, an “offshore processing center,” but Boochani counters in the title of his book that it’s a prison. No Friend But the Mountains was written via in Farsi via WhatsApp while Boochani was detained at Manus. The messages were translated into English from Farsi by Omid Tofighian, who accepted the awards on Boochani’s behalf. The book is a combination of poetry, journalism, and critical theory. 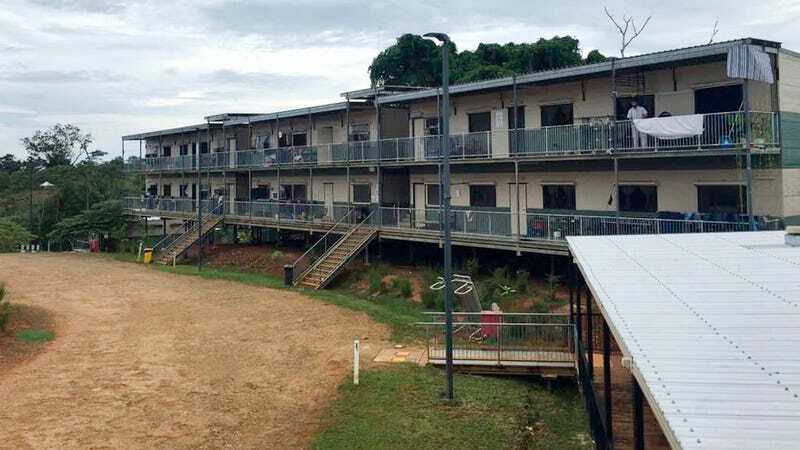 The detention center at Manus Island has been ruled illegal by Australia’s Supreme Court and by many international aide organizations. In 2018, Doctors Without Borders issued a report revealing dozens of attempted suicides among the hundreds of people being held there. Manus Island has been officially closed, but those who have been held there since 2013 are still awaiting release. No Friend But the Mountains won the Victorian Premier Prize in two categories, both the highest award, the Victorian Prize for Literature, and in the nonfiction category. The honors come with $125k in Australian dollars, or about $90k U.S.
“We all hope that finally, after five years, we get freedom in a place like America or other countries,” Boochani told NPR.